The World Health Organization estimates that genetic birth defects affect 7.9 million children worldwide every year, and 94 percent of those births occur in low- and middle-income countries. Many of these defects are preventable and treatable. But without the infrastructure in place to track genetic information, health providers in developing countries can’t capture the real-time, region-specific data necessary to provide community genetics services such as birth registries and genetic risk assessment counseling. Shane Quinonez, M.D., a medical geneticist at University of Michigan’s C.S. Mott Children’s Hospital, is changing that. His solution capitalizes on one of the most accessible technologies in the world: smartphones. 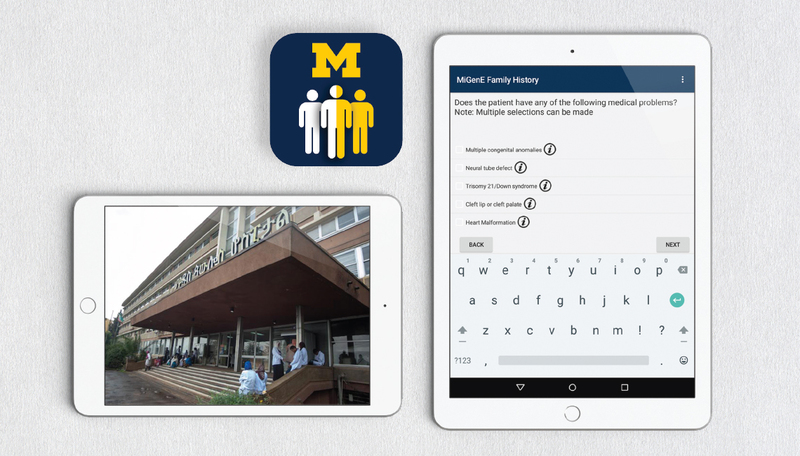 Quinonez conceptualized the MiGene Family History Application, a mobile app that assists physicians in gathering patient demographic data and medical histories. It also helps them track this data and provide community genetics care to their patients. We hope to establish an Ethiopian research network so that they can collaborate and design their own studies on the epidemiology of disorders in Ethiopia. –Shane Quinonez, M.D. Launched in summer 2016, MiGene was developed through a partnership between U-M’s departments of pediatrics and of obstetrics and gynecology, and St. Paul’s Hospital Millennium Medical College, or SPHMMC, in Ethiopia. SPHMMC pediatricians, OB-GYNs and fetal medicine specialists are using the MiGene app to trace patient histories of conditions such as Trisomy 21/Down syndrome, cleft lip and/or palate, heart malformations and intellectual disability. It will track the number of diagnosed living and deceased relatives to establish a three-generation lineage. Based on the medical diagnoses entered, genetic counseling information is provided to the physicians to pass on to the patients. Collected data will also be used, with patient consent, for epidemiologic study at the U-M. Additionally, Quinonez and his team surveyed SPHMMC patients about their preferences and attitudes regarding prenatal testing and the potential termination of pregnancies due to certain birth defects or genetic diseases. Quinonez and his team plan to publish the results of the MiGene study, and they hope their research will pave the way for future work in community genetics in developing countries.